What’s Best: Right-sized for five, accomplished handler, it comes in a stick! Tired of the nonstop, breathless stories about self-driving vehicles? 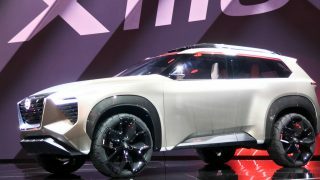 The automakers seem hell-bent on handing over the act of driving to algorithms and optical sensors. It won’t be long before getting into a “car” will offer no more excitement than stepping on an elevator. Judging by how designers have envisioned tomorrow’s rectilinear autonomous vehicles, an elevator is a fitting model: a box that shuttles passengers sideways instead of vertically. U.S. president Richard Nixon glimpsed the future when he approved a brave experiment in urban transit in 1969. The Personal Rapid Transit system of Morgantown, West Virginia, is a 6-km circuitous guideway used by automated electric modules that take riders to any of five destinations in town. Like an elevator, users step in and press a button corresponding to the station where they want to get off. Computers do the rest. Depressing, isn’t it? Those of us who still like – no, crave – piloting an automobile along a sinewy country road and shifting gears by hand will be hanging on to cars like the Honda Accord. The Accord is the lawnmower company’s venerable sedan and coupe that set the bar for what a do-everything-well car should be. Reviews have long touted the Accord’s talented front-drive platform, refined and fuel-efficient drivetrains, roomy cabin, great visibility and fun-to-drive character. 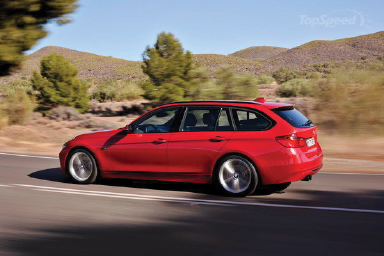 “A car that would round off the frustrating edges of a commute – a low-heart-rate kind of sedan in traffic, but an athlete on entrance ramps,” summed up one magazine editor. Sweetening its appeal is a silky six-speed manual transmission that shifts with snick-snick precision. Sadly, it’s a rare treat these days; the only competitors offering a stick in a mid-size sedan are Mazda and Volkswagen. In fact, the ninth-generation Accord, released in late 2012, represented a return to form after Honda let the previous model grow a little too big and unwieldy. 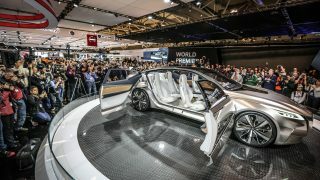 Designers excised a couple of centimetres out of the wheelbase and 9 cm of overall length to make the Accord more lithe, without sacrificing its big-car interior. 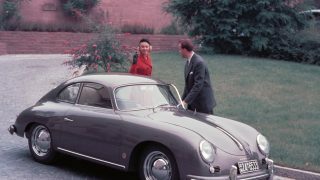 It didn’t hurt that the car received some handsome lessons, too. Torsional rigidity of the new platform improved by 42 per cent compared with the previous car. Gone was the brilliant control-arm front suspension, replaced by common MacPherson struts, yet the Accord retained its appetite for curves with direct and communicative steering – even though it’s electric. Honda’s endemic “lightness of being” happily remained intact. Occupants are treated to a bright, airy cabin thanks to a low beltline and big expanses of glass, just like the Accords of old. The pillars are as slim as possible, a boon to drivers who’ve had the disquieting surprise of a pedestrian appearing out of nowhere. 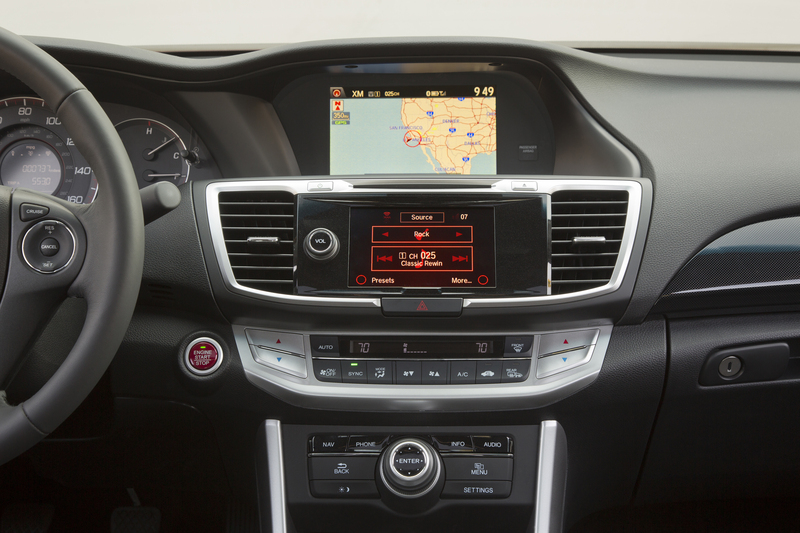 The instrument panel features large-print gauges and a multi-tier layout that’s become a Honda fixture, with larger screens and more (optional) high-tech gear, including LaneWatch, which provides a camera view of the adjacent lane. 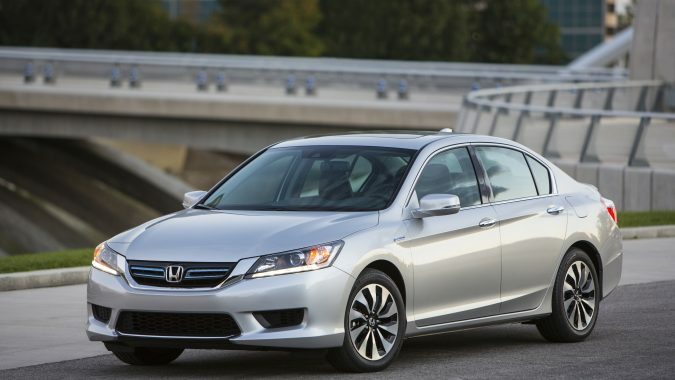 Thanks to better insulation and active noise cancellation systems, the Accord is genuinely quiet for the first time. But despite the improved cabin furnishings, the seats have raised the ire of some owners. 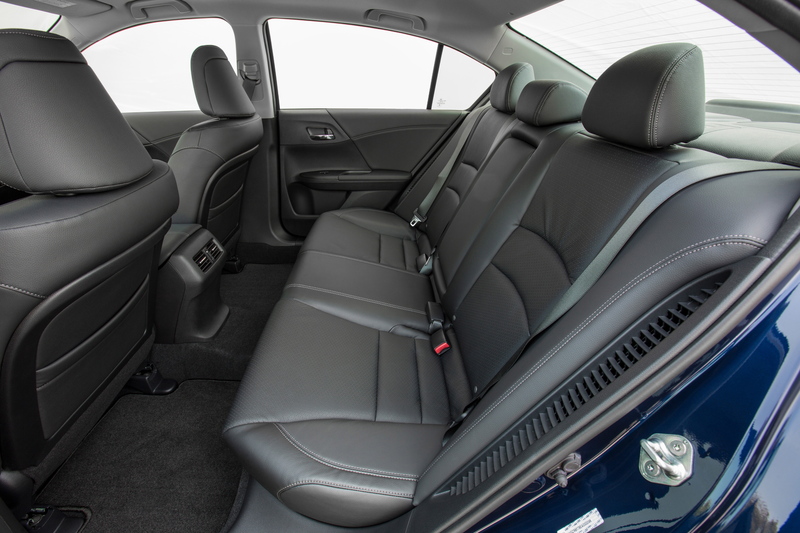 The well-bolstered seating is stiffer than most, and the automaker’s zeal to provide better whiplash protection has garnered scorn. 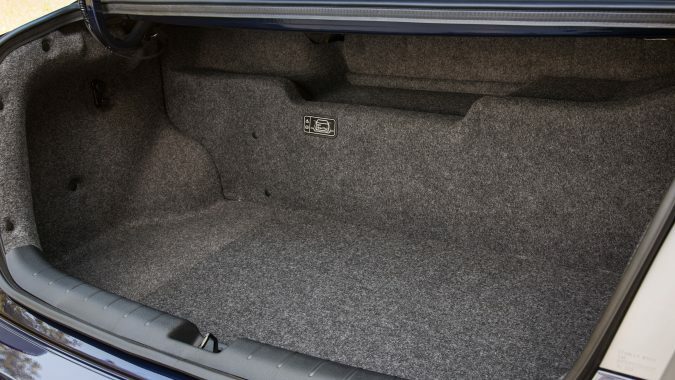 “Headrests are so poorly designed my neck and back ached constantly, until a Honda parts manager told me to turn the headrests around,” wrote one driver online. It’s not recommended, of course, but do plan on a lengthy test drive to see if the seats agree with your backside. 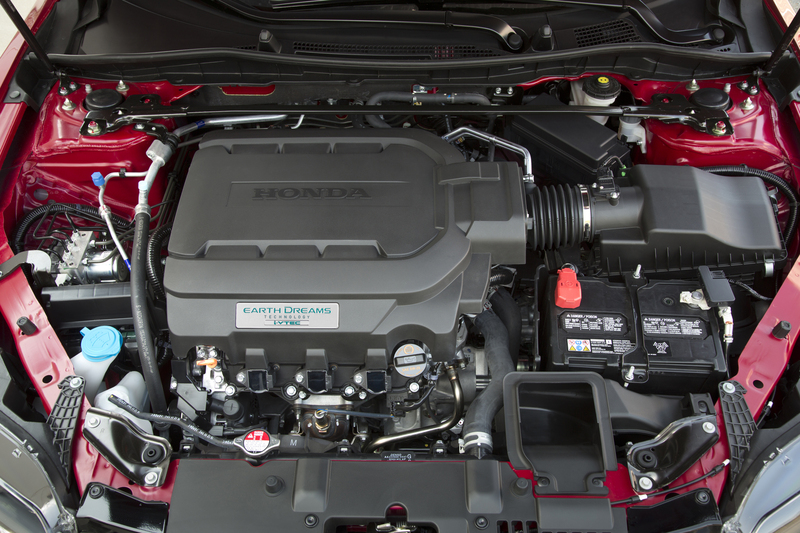 Most models are motivated by Honda’s familiar DOHC 2.4-L four cylinder, outfitted for the first time with direct injection to make 185 hp (189 hp with dual exhaust) and 181 lb-ft of torque. In addition to the six-speed manual gearbox, buyers could opt for a continuously variable (CVT) automatic of Honda’s own design. Also optional was a SOHC (24-valve) 3.5-L V6, good for 278 hp and 252 lb-ft of grunt. Engineers increased the time its Variable Cylinder Management system runs on three cylinders to boost efficiency. The V6 is packaged with a conventional six-speed automatic transmission, although coupe buyers could order it with the manual transmission. 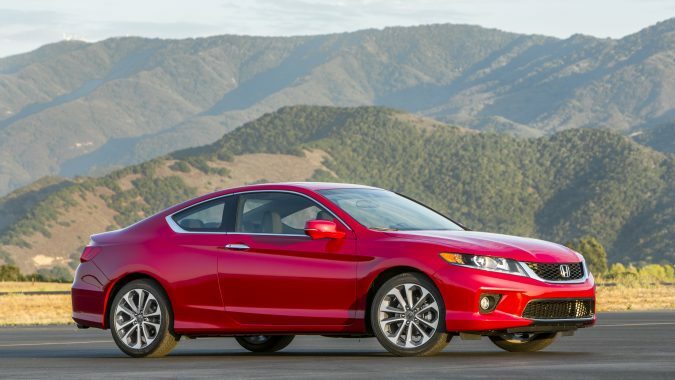 In U.S. government crash testing the 2013 Accord sedan received five out of five stars for overall and side crash protection, but four stars for frontal protection; the coupe earned five stars all around. Hybrid models, including a plug-in, arrived for the 2014 model year. 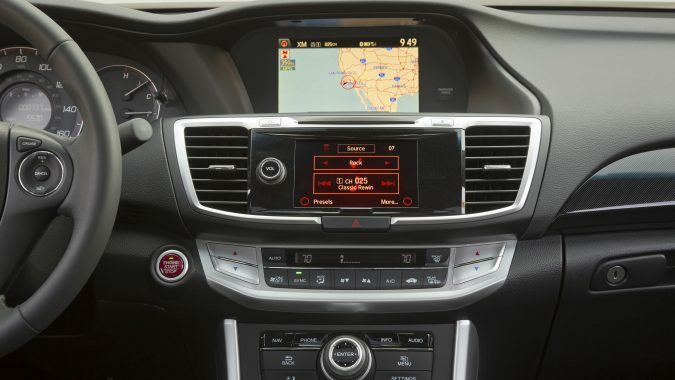 The Accord got a mid-cycle refresh for 2016 that included exterior styling tweaks with LED taillights and splashes of chrome, retuned suspension settings, new cabin trim and an optional 7-inch touchscreen with Apple CarPlay and Android Auto functionality. 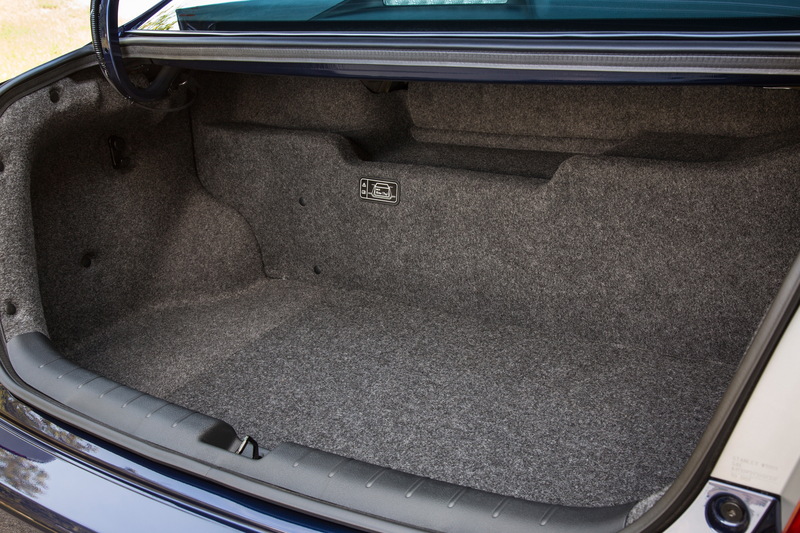 All sedans except the base LX got a 60/40-split rear seat to extend the utility of the large trunk. 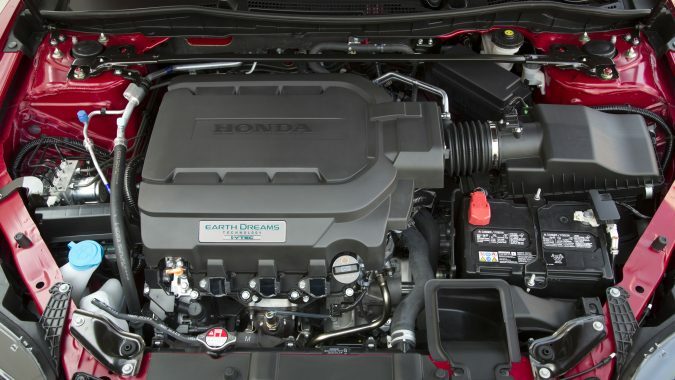 The world’s largest engine manufacturer (if you count Honda’s motorcycles, generators and more) imbued the Accord with spirited acceleration coaxed from its meagre 2.4-L four banger. Zero to 97 km/h comes up in 6.6 seconds with the manual transmission, and 7.7 seconds with the CVT. 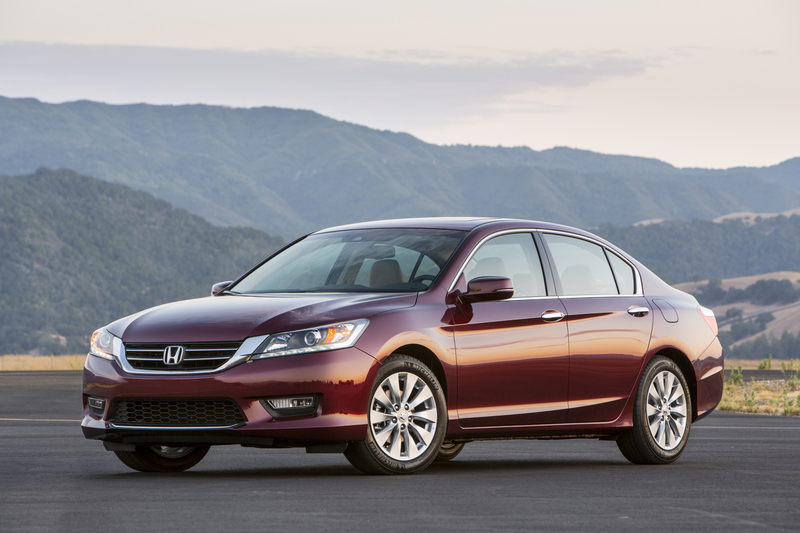 Fitted with the V6, the Accord is righteously speedy, taking just 5.6 seconds to attain highway velocity. 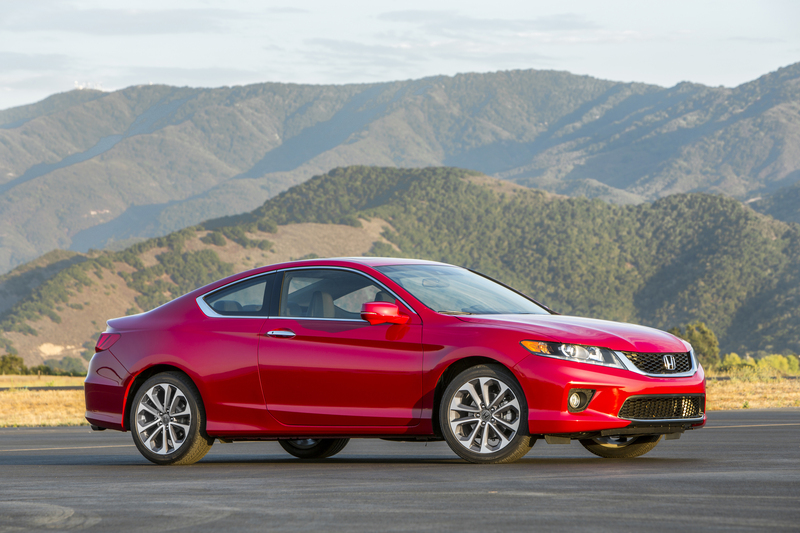 Although the Accord can’t really be called a sports sedan, the ninth-gen car feels particularly lithesome and well balanced. One potential downside is the firm ride, which more than a few owners found a little jarring. Deserving special mention here is Honda’s CVT autobox, considered the best of the breed with its smooth and quick operation. The typical rubber-band delay has been minimized and it responds almost instantly when acceleration is summoned, though there’s some audible transmission whine at high rpms. Most importantly, the belt-and-pulley machinery pays dividends in terms of fuel use. 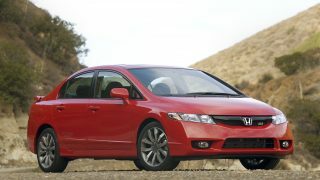 Owners raved about the Accord’s ability to sip gas both in the city and at supra-legal highway speeds. 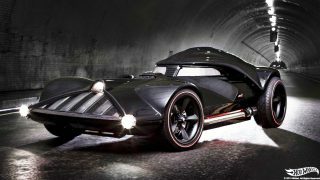 This is one car that can beat its government fuel efficiency ratings. 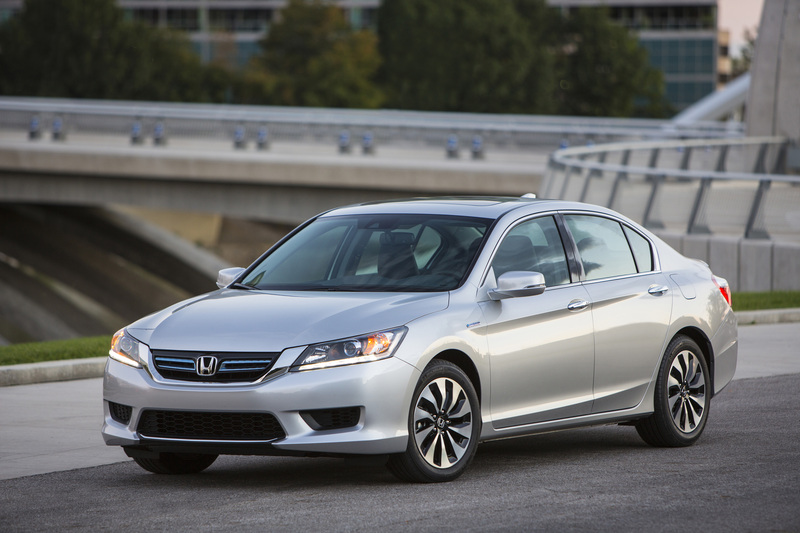 Built in Ohio since 1982, Honda Accords are everywhere and for good reason. Reliability is reputed to be stellar – you can still spot 25-year-old models on the road – although there was a spate of automatic transmissions failures in the early 2000s that rankled owners. The all-new-for-2013 Accord flew off of dealers’ lots thanks to the fetching design and glowing reviews, though some cars did begin to exhibit mechanical issues over time. “Two months ago I developed an issue with the starter. I’ve replaced the starter twice and tonight got stranded and had to call a tow truck. I’ve gone to the Honda dealer and, of course, there’s an issue with the starter, but it will cost $1,000+ to fix!” reads a post by an unhappy owner. According to owners, the starter motor may barely outlive the three-year factory warranty. Honda issued a technical service bulletin outlining complaints of grinding or spinning noises at startup. A class action lawsuit attempted to blame out-of-spec clearance between the starter and the torque converter ring gear, but it was tossed out. The affliction appears limited to 2013 and 2014 models. 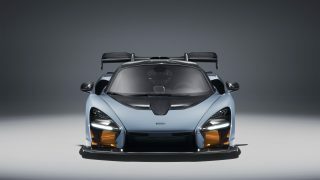 Another concern is the prospect of the electric power-steering system cutting out while the car is underway. Drivers report it can happen during parking maneuvers, rendering the wheel hard to turn, but more disconcerting is spontaneous failure at highway speeds. Motorists can steer to the shoulder, turn off the engine, then turn it on to reset the system. Owners are correct to call it an unsettling experience. Oil consumption by the 2.4-L “Earth Dreams” four-cylinder engine has been an issue in significant numbers. Some drivers have added as much as three litres of motor oil between oil changes, although others need only add one – which dealers dismiss as normal. Other mechanical flaws include audio system glitches, short-lived batteries and wheel bearings, jerky CVTs, and trunk lids that come down on people’s heads on the slightest incline.